Today the Alaska Supreme Court upheld the constitutional right of Alaska citizens to raise issues and vote on them. The decision allows an initiative updating and strengthening state law protecting fish habitat to appear on the November ballot. The initiative, as approved by the Court, would reform the law by creating a public process. Currently there is no process. The ballot measure also includes standards for fish habitat managers to follow when assessing impacts to fish. These standards include water quality and temperature, and other conditions vital for fish to thrive. The proposed law further adds needed enforcement tools for the Alaska Department of Fish and Game to use when protecting fish and wildlife. In its decision, the Court severed, or removed, language that would have required Fish and Game to deny permits when it determined that a project would substantially damage fish habitat. This decision stems from the Court’s concern that such a requirement undermines the authority of the legislature to appropriate state resources. In other words, the decision to deny a permit is now not required by the initiative, but rather left to the discretion of Fish and Game. If passed by voters in November, the law will create a tiered permitting system that puts more scrutiny on projects that do more harm. It would also mandate a public process before Fish and Game can issue fish-habitat permits and it will include all fish habitat under Fish and Game’s permitting authority. Right now, Fish and Game can only permit fish habitat that has been expressly included in regulation. Trustees originally filed the lawsuit on behalf of Stand for Salmon in September 2017, shortly after the State rejected the ballot measure. 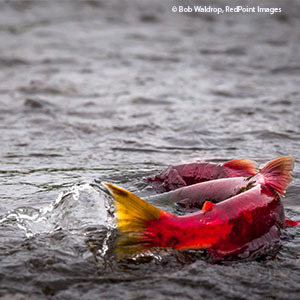 The Alaska Superior Court ruled in Stand for Salmon’s favor the following month, allowing the initiative’s supporters to collect and submit over 50,000 Alaska signatures to the Division of Elections in January 2018. The division certified the initiative in March. By then, the State had appealed the Superior Court’s decision. During oral arguments before the Supreme Court in April, Brown argued that the initiative establishes clarity through a permitting process that requires more scrutiny based on the harm done to fish habitat. It’s not the size of the project that matters, but the amount of harm it does, she said.